Blood pressure basics: What do "systolic" and "diastolic" mean? Every time you go to the clinic, you get your blood pressure checked. Those numbers are recorded in your medical record each and every time. What do those numbers mean and why are they important? Your heart pumps blood throughout your body in a system of arteries, veins and capillaries. The force with which that blood moves is called blood pressure. “Think of it as resistance,” says John P. Erwin III, MD, Scott & White Cardiologist. You want low numbers, low resistance. Dr. Erwin explains the basics of blood pressure and what the numbers mean. “There are two numbers used to measure blood pressure. The top number is called systolic. That measures the pressure when your heart contracts and pushes the blood through your arteries. The bottom number is called diastolic. That measures the pressure in your arteries when your heart is relaxed and refills with blood,” explains Dr. Erwin. Your blood pressure is taken with an instrument called a sphygmomanometer. A rubber cuff is placed around your upper arm; a health-care worker pumps up the cuff with air, listening for your heartbeat. When the thumping stops, he or she will pump it up further and then begin a slow release of the pressure. The cuff functions as a tourniquet briefly stopping the flow of blood in your artery. The health-care provider listens for the blood to begin flowing again. He or she will note the first heartbeat—the systolic pressure; then he or she will listen for the final beat—the diastolic pressure—when there is no more resistance made by the cuff and the blood is flowing smoothly. The numbers recorded are written as one number over the other as in 120/70, and said as “120 over 70.” The numbers represent millimeters of mercury, which is abbreviated mmHg. “Both the systolic and diastolic numbers are important for a healthy blood pressure,” advises Dr. Erwin. “You want your blood pressure to be less than 130/80, on average. Both numbers need to be in the ideal range. The old, conventional wisdom was that only the bottom number mattered. That’s not true. Heart disease, stroke, and kidney disease can all be increased by a high systolic pressure as much or more than elevated diastolic pressure,” Dr. Erwin advises. Blood pressure can vary a lot during the day, depending on a number of factors. Exercise, stress, and anxiety can raise your blood pressure. Even in a single day, your blood pressure can fluctuate dramatically depending on what you’re doing. If your blood pressure stays high, you might have a condition called high blood pressure, or hypertension. “Hypertension is dangerous because the heart then has to work much harder and it causes injury to blood vessels. This puts one at greater risk for heart disease, stroke, and kidney disease,” cautions Dr. Erwin. 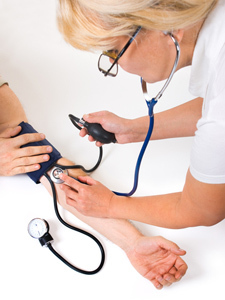 The Joint National Committee on Prevention, Detection, Evaluation, and Treatment of High Blood Pressure recommends screening adults for high blood pressure every two years if their blood pressure is normally less than 120/80 mmHg; however, the Committee recommends that adults with high blood pressure should have their blood pressure checked every year or more often.